During the Second World War, an influx of international students at the University of Toronto's law school led to a student body more racially diverse than was the case before or for some time afterwards. In 2007, the Law Society Archives acquired a series of photographs that documents this little-known development. 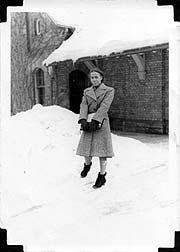 Thelma Kerr Thomson, a law student at the university during the war who went on to practise law in Lindsay, counted among her classmates a number of law students from the Caribbean who, because trans-Atlantic transportation during the war was too dangerous for them to attend the Inns of Court in London as the usual regulations required, acquired their qualifications in Toronto instead. First year law class, University of Toronto, 1942. Thelma Kerr Thomson, who donated these photographs to the Law Society Archives, is seated in the front row centre, to the left of Eugenia Charles. 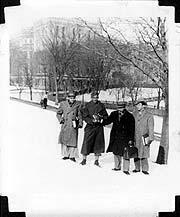 University of Toronto law students Fred Kelsick, with Jamaican students Eric Tomlinson, Basil Rowe and Ram Pershad, circa 1942-1946. In his biography of Bora Laskin, Philip Girard speculates that these students from the Caribbean were probably the first black students to study law at the University of Toronto. Laskin, then secretary of the Faculty of Law, handled the arrangements for their arrival and welcomed the first two students in the fall of 1941. According to Girard, the students were well-received in Toronto and did well. Telford Georges of Dominica, for example, was voted the recipient of the Maurice Cody Award for his contributions to college activities in 1947. Many of the law students socialized as a group. Thelma Kerr invited several of these student friends home for Sunday supper, and a photograph of the International Students' Club Valentine's Dance held in 1946 shows several non-white faces among those who attended. Bora Laskin thought these students gave the law school good publicity and that they enjoyed their time in the city. Moreover, they boosted the enrolment at the law school, which had declined because of the war. Eugenia Charles as a law student at the University of Toronto. She went on to become Prime Minister of Dominica. Most of these students returned to the Caribbean after completing their legal education and several went on to achieve prominence in their countries of origin. For example, Eugenia Charles was the first woman lawyer in Dominica, and the first woman Prime Minister of that country, a position she held from 1980 to 1995. Telford Georges was gold medalist in 1947, and went on to serve as Chief Justice of Tanzania, Zimbabwe and the Bahamas. Noor Hassanali became President of Trinidad and Tobago and Louis Fox became a judge on the Jamaican Court of Appeal. 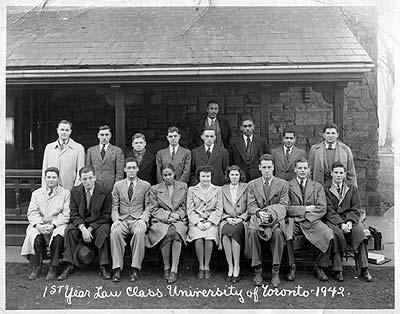 Although these students did not become lawyers in Ontario, their presence here during the war was significant, representing the first significant wave of racialized law students in the city and the province of Ontario.